One mother has just apparently demonstrated exactly how to solve – and win – a family argument with only a great arm and a flip-flop. This viral video shows the hilarious moment an angry mum throws her flip-flop at her fleeing teenage daughter – and hits her with an incredible long range shot worthy of Tom Brady. We’ve all been there, haven’t we? Belligerent teen argues with mum and gets a clip round the ear for insolence. It’s a classic story – if a little controversial – which has just been flipped (sorry) on its head. An eyewitness with a smartphone filmed an unidentified woman walk out into the street from behind a car as her daughter can be seen running away into the distant during an apparent family row. The video then shows the mother deftly removing her flip-flop and purposefully launching it at the teenager, who’s by now some 30 metres (98 feet) away. A man can be heard in the background of the clip – filmed at an undisclosed location in Mexico – cheerleading the parenting athletic prowess. Go on, hit her, hit her! And, incredibly, the flip-flop flies as straight as an arrow – high into the air – before hitting the daughter square between the shoulders and knocking her off balance. Indeed, the young woman is so surprised she falls over in the street, while her mum is seen laughing so hard she has to lean on a car for support as she turns away. The video was later shared by a Twitter user going by the handle @nino_triqui on the social media platform, where it’s been absolutely flying – not unlike the now famous flip-flop itself. The now-viral video has notched up more than 1.3 million views and more than 60,000 likes, at time of writing, with much of the Twitter jury weighing in on the video’s validity. 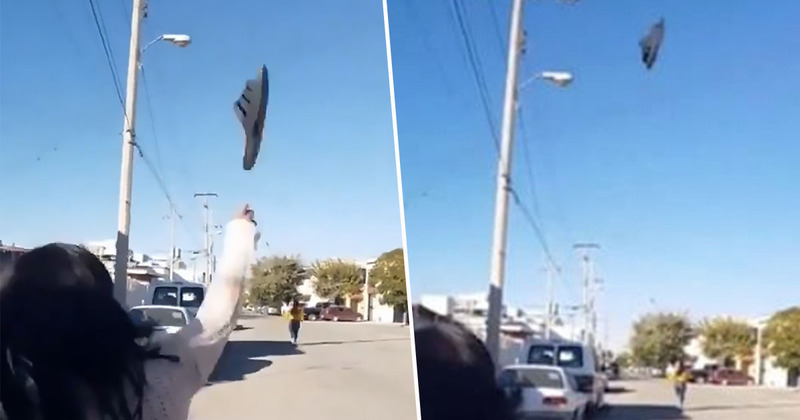 Many online viewers said the woman appeared to be world-class in the noble art of the ‘chanclazo volador’ (flying flip-flop), and joked the so-called sport should be a popular way for mums to punish their errant daughters. One user with the handle @ramondario66 said the flip-flop must have had ‘a heat-seeking radar for sure’. All my respect and admiration to that lady! That should be an Olympic sport! Upon closer inspection, the flip-flop must surely be weighted to fly so far – meaning it probably packed quite the punch. Thank God she has not got an equally talented foot otherwise even Messi would be scared of her. Undoubtedly, the video does look a little too good to be true – not for the alleged victim of said flip-flop throwing, mind. Some suspicious customers noted the footwear actually leaves the camera view during the video, and suspect foul play. A front runner for the Didn’t Happen Of The Year Awards 2019, perhaps? What do you think?